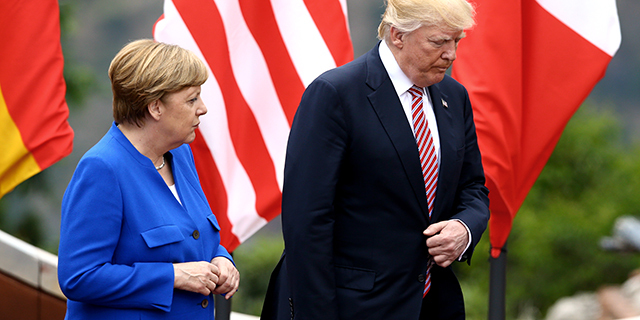 German Chancellor Angela Merkel arrives in Washington this week to meet with President Donald Trump at a moment of tension in the transatlantic alliance. Discussions between the two leaders will likely feature some significant disagreements over issues such as the Iran nuclear deal, trade, climate change and military spending. 1 Americans think U.S.-German relations are in good shape, but Germans disagree. Roughly two-thirds of Americans say relations are good, compared with just 42% of Germans, according to polling conducted by Pew Research Center in the U.S. and by the Körber-Stiftung in Germany. 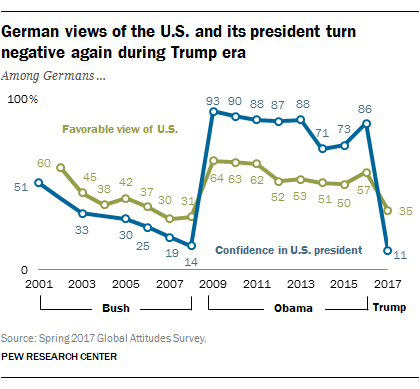 2German attitudes toward the U.S. have turned sharply negative in the Trump era. 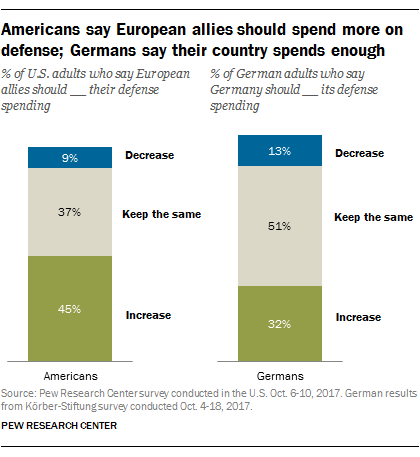 In Germany, attitudes toward the U.S. have followed a clear pattern over the past decade and a half. During the course of President George W. Bush’s two terms in office, confidence in his leadership and overall ratings of the U.S. declined among Germans amid strong opposition to key elements of Bush’s foreign policy. President Barack Obama, in contrast, was extremely well-regarded in Germany (although his ratings did decline somewhat following the National Security Agency eavesdropping scandal), and his presidency coincided with a rebound in America’s overall image. However, as our 2017 Global Attitudes Survey found, German views toward the U.S. have dropped once again since Trump’s election. Only 11% of Germans expressed confidence in Trump to do the right thing in world affairs in 2017, down from 86% for Obama in 2016. And just 35% said in 2017 that they had a favorable opinion of the U.S., compared with 57% the year before. 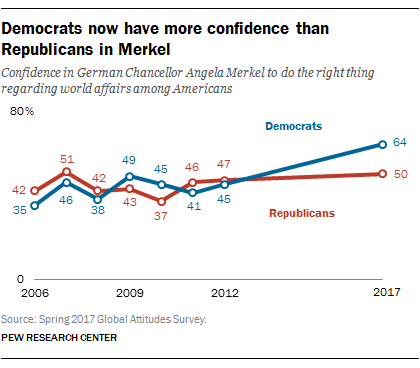 3 Merkel gets positive reviews from Americans, especially Democrats. Since Pew Research Center first asked about Angela Merkel in the U.S. in 2006, three main findings have stood out. First, positive ratings for Merkel have consistently outweighed negative ones, and this was true again in 2017, when 56% of U.S. adults expressed confidence in her. Second, Merkel has become better known. In 2017, only 14% offered no opinion about the German leader, down from 31% as recently as 2012. Third, a partisan divide has emerged over Merkel. In 2012, there was virtually no difference in the views of Democrats and Republicans, but in 2017, 64% of Democrats had confidence in the chancellor, compared with 50% of Republicans. 4Many Germans see the U.S. as a top foreign policy partner; fewer Americans feel the same way about Germany. When asked which countries are their most important partners in global affairs, Germans name France more than any other country, but the U.S. is in the second spot. 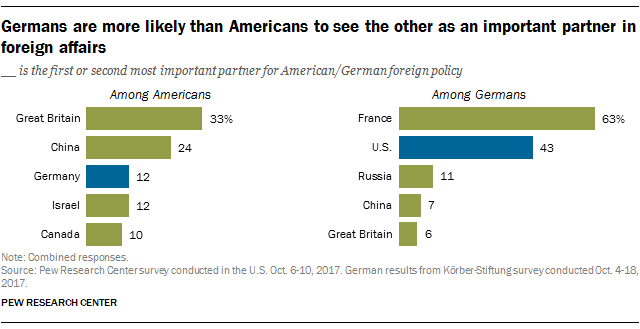 More than four-in-ten Germans say the U.S. is either their country’s first or second most important partner. Americans are much less likely to see Germany this way: Only 12% name Germany as one of America’s top two partners. Still, Germany does make the top four, trailing Great Britain and China and tying with Israel. 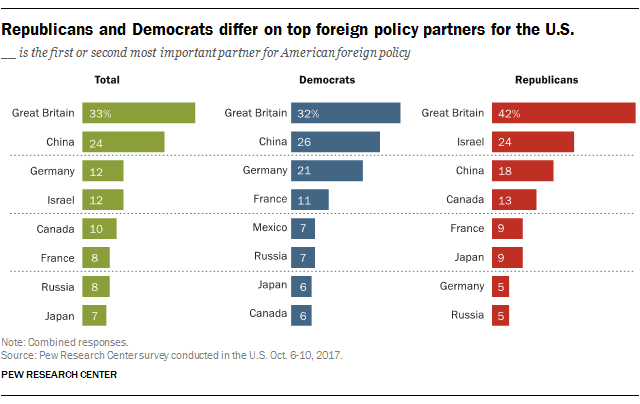 5Democrats are more likely than Republicans to see Germany as an important partner for foreign policy. While 21% of Democrats name Germany as one of America’s top two international partners, only 5% of Republicans feel this way. Democrats also take a more positive view of Germany’s role in world affairs – 52% of Democrats say Germany does the right amount to help solve global problems, compared with 31% of GOP supporters and 37% of independents. 6 There are transatlantic differences about defense spending. Successive American presidents have called on NATO allies to spend more on security, and Trump has repeatedly pressed the issue. As our 2017 poll shows, there are significant differences between Americans and Germans on this topic, as well as significant partisan differences within the U.S.